Got my new dust mask yesterday. I have not had a chance to really give it a trial yet, but it appears to be a real gem. I used to have a Dustfoe brand mask and I used it so much I actually wore it out. Unfortunately, they quit making them and you can’t buy one any more. Highland has been looking for a replacement for many years. Masks tend to fall into two categories, i.e. the whole face, gas mask type, or the little cloth mask which fits over your mouth and nose and fogs up your glasses. Prices range from over $300 down to $1.80 with effectiveness commensurate with the price. What is needed is a good effective mask somewhere in a price range which does not interfere with usage. 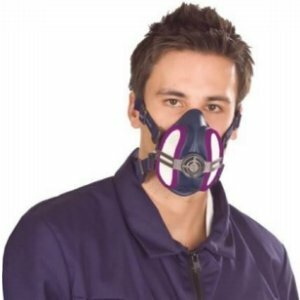 Technically, the mask is rated NIOSH P100 (National Institute for Occupational Safety and Health) and captures 99.97% of airborne particles and is resistant to oil. For your own safety if you are doing something besides woodworking, then go look up the ratings and make sure you are being safe with this mask. For folks with a beard – or any facial hair – like myself, any respirator you see on the market is less effective so you can assume the claims of 99.97% won’t apply. To put it on your face, grasp the front of the mask and then pull the bottom strap over your head and down onto the back of your neck. Take the other strap with the wide headband and stretch that one onto the top back of your head and then adjust the straps to fit. Cover the exhale hole with the palm of your hand, exhale, and you should get a bit of expansion in the mask before it releases air at the side of your face. If you don’t get the expansion, then you need to tighten the straps to get a better seal. Or shave. When I bought mine, I went ahead and purchased an additional set of filters so I will have a replacement set if I ever need them. The filters are made like an air cleaner in your car with a folded filter element which you should be able to clean by bumping it lightly or blowing it out with air pressure. If it gets where you can’t breathe through the mask, then change the filter. Duh! All in all, an excellent piece of work and this one comes highly recommended. Get you one and stop coughing. I have been looking at getting this mask as well but I am wondering if Highland will ever offer the organic vapor cartridges for this mask. I would really like 1 mask for dust as well a painting/finishing? I see the company that makes this mask does offer the Organic cartridge as well but Highland does not have it available in their catalog?? Anyone know why or if they can get them. Signed making dust in sunny Southern California but missing my favorite wood store in ATL. The Plane Facts: Bronze versus Cast Ductile Iron #4 Plane The Tormek T3 Grinder: Get One Before They are Gone!